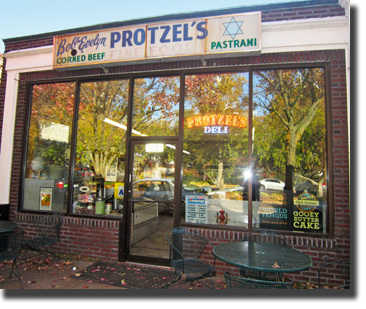 Protzel’s Deli - A Clayton Tradition In the beginning... On October 1, 1954, Bob and Evelyn Protzel opened their delicatessen with dreams of great success and prayers that they would feed their young family. They were making ends meet – at 16 hours a day 7 days a week – they should have, but far from an outrageous success. Bob and Evelyn did all that they could to put forth the best food at a fair price. The prepared their own salads fresh every day, made gefilte fish, roasted briskets, cooked corned beef and tongue, they even made their own pickles and ground fresh horseradish. It was not easy, but it was theirs. Word spread about the new deli with the cute young couple (Bob was 29 and his dear Evelyn was 25). People who visited the store quickly fell in love with them, and they returned often for their good, fresh home made delicatessen specialties. About two years after the store opened, a retired deli man that had frequented the store took Bob aside and offered to share a special secret on how to prepare the best corned beef he would ever taste. The condition was that he must agree to pass the secret to a young, kind and deserving deli man when he retired, but at no time would he otherwise sell it or give it away. Bob agreed, and so with nothing more than a handshake, the secret was passed to Bob. Now, along side Evelyn’s proudly displayed chopped liver, roasted briskets and other specialties was what was to become Bob’s trademark–“THE FINEST CORNED BEEF ANYWHERE”. Over the years the deli has become something of a landmark (over 55 years in the same location will do that) – children who once shopped for penny candy now bring their children and grandchildren as a rite of passage. Couples that met at the deli and have been married for years return for their favorite treats and that “sentimental flavor”. People that have moved out of town return to find things somewhat different, yet comfortably and nostalgically the same. No one wants to grind horseradish anymore, penny candy is but a memory, and most sadly, so are Bob and Evelyn. Over the years, the store has added seating so friends can eat in. The once crammed shelves now offer a wonderful selection of mustards and specialty items, and the bakery case boasts fresh breads, bagels and rolls, homemade cookies and komish bread (mandel bread, mandel brot, komish broit, etc.). The deli cases burst with a variety of salads (including Evelyn’s wonderful potato salad), pickles and pickled tomatoes, delicious home made knishes and kugels, chopped chicken livers, as well as the freshly prepared deli meats. You can even get a hot bowl of Joanie’s wonderful chicken soup with matzo balls, homemade kishke (if you don’t know, don’t ask) or a bagel with freshly hand sliced nova, cream cheese, tomato, onion & capers. Unchanged is the personal, warm and friendly service, our first salami (framed and hung above the meat slicers), fresh homemade delicacies prepared daily, and as always, THE FINEST CORNED BEEF ANYWHERE. Thank you for making us a tradition.